I made the cards by stamping my 'keys' in black on ivory cardstock. I then stamped the title a second time and matted it on black to set it apart. I chose four different flowers and inked them in shades of orange & purple (my color kick this month, I guess!) using Clearsnap chalk ink cats eyes (I *love* these for blending colors) and stamped over the text. I trimmed & matted the image in black, adhered to a colored card and tied some fun fibres around for a bit of texture! 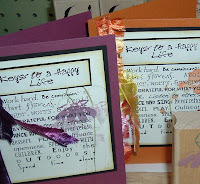 Quick & simple cards, perfect for a variety of occasions!